Have you heard the open secret? 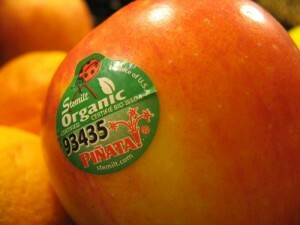 That you can tell if you’re eating GMO by the PLU found on the stickers on your fruit? Well, it turns out this is an urban legend. No, 8 does not mean GMO and 9 does not mean organic. So, how can you find out whether or not you’re eating GMO food? You can’t. There are some useful tips for avoiding GMOs, but you can’t be 100% certain. Why is this a big deal? Isn’t GMO food going to save the starving children of the world? Here’s a response I posted to a friend of mine who echoed that assertion on Facebook. When Monsanto’s activities are making life significantly more difficult for organic farmers, this practice actually artificially drives up the price of organic produce and makes it almost impossible for the poor to eat organic. Further, when we are burning crops on a regular basis to keep prices up, the increased yield of GMO’s is a red herring in this discussion – especially in the industrialized world. b. The impact of these GMO’s is something we simply can not predict. Given what we know about epigenetics now the impact of this practice could cause serious damage for generations. The organic food that we eat now is the result of millions of years of evolutionary optimization. To think we can tamper with that without possible unforeseen impact is hubris on the part of Monsanto and their regulatory allies. c. We are operating under the assumption that the primary constraint in food distribution in the 3rd world is crop yield. It is one of many possible constraints that could be adjusted to increase distribution. Further, even if it is the prime constraint (which it may very well be in certain regions) GMO is not the only way to increase crop yield. Super tired yesterday, but it’s no mystery as I got about 4 hours of sleep. Need to get that back on track as sleep is essential for recovery.